After three-and-a-half-years, it is with great pleasure that I can announce I have finally completed my PhD thesis, which I submitted for examination at the Monash University Institute of Graduate Research (MIGR) on Monday 3 February 2014. The full title of my thesis is The Ghost Who Walks: A Cultural History of The Phantom Comic Book in Australia, India and Sweden and, as you can see from the accompanying photo, it’s quite a hefty tome as well. In fact, it’s approximately 100,000 words in length, and weighs in at 513 pages (which includes the bibliography and appendix). 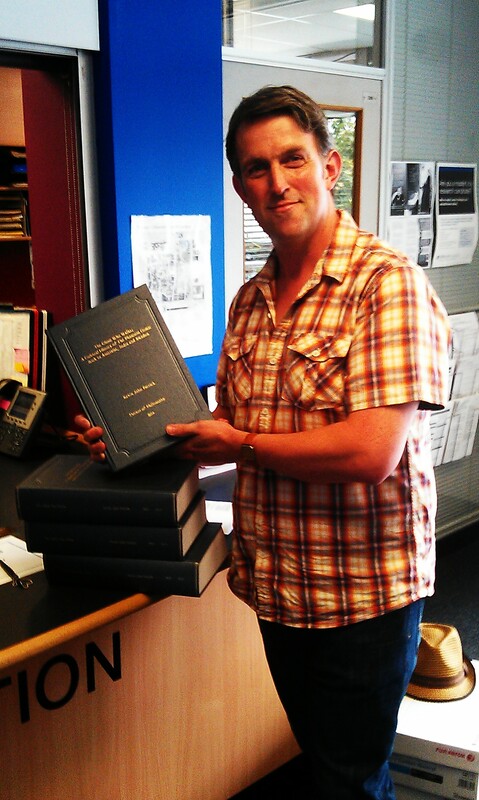 No wonder I look both exhausted and elated in this photograph – you would be, too, if you had to lug five bound copies of this thesis across Monash University’s Clayton campus! If – however briefly – you’ve ever wondered why there have been no posts or updates made to this blog since 19 July 2013, I hope this announcement will go some way towards explaining my prolonged online absence. The last six months of 2013 were arguably the most gruelling, and demanding, of my entire PhD candidature, wherein I completed a 1st-draft version of the entire thesis, before undertaking 2nd-draft revisions, which in many respects proved to be a no less challenging task. The fourth chapter, which examined the international syndication of The Phantom comic strip to Australia, India and Sweden, was especially difficult, as I struggled to compress several decades of print media history into a succinct, yet comprehensive narrative. While I am still emotionally too “close” to the events leading up to its completion to be entirely objective about my thesis, I am nevertheless satisfied with the finished product – let’s just hope my thesis examiners feel the same way I do. Speaking of which, it typically takes examiners anywhere between 8-12 weeks (and sometimes even longer) to deliver their reports on a PhD thesis, which means that I may not learn the outcome of their assessments until May-June 2014. Until such time, I can’t publicly disclose or reveal any results or findings from my thesis. However, in the (hopeful) event that my thesis is “passed” without any requests for changes or modifications, I can then begin to submit articles for publication with academic journals, as well as deliver presentations at academic conferences, wherein I can present my research findings to a wider audience. Be rest assured that I will promote these activities, as they occur, here on this blog – so, stay tuned! In the meantime, however, I’d just like to take this opportunity to publicly thank the nearly-600 Phantom comic-book “phans” from Australia, India and Sweden, who took the time and effort to complete The Phantom Comic-Book Survey, which became such an integral part of my PhD thesis. My supervisor warned me from the outset that most postgraduate research surveys are lucky to attract 100 participants at best; so both she and I were amazed – and delighted – to receive such an overwhelming response. Most PhD students would consider themselves lucky to have the opportunity to engage with such an enthusiastic and articulate survey audience, and I feel especially blessed to have received such generous and thoughtful responses to my own survey. So, thank you all once again for sharing your opinions and recollections of The Phantom with me – my research findings will be all the richer for your invaluable contributions. (Thanks, too, must also go to the numerous Phantom “phan” websites, blogs and message boards which promoted The Phantom Comic-Book Survey to the wider “phan” community). So, “what next, Kevin?”, I hear you ask. Well, for now, I’ll be employed as a sessional tutor at Monash University (Melbourne), helping to deliver a new undergraduate unit, ATS1279 – Media and Culture. There are also several comics-related research project ideas – not connected to The Phantom! – which I’d like to develop further, either as academic journal articles, or in other formats. Once again, I’ll keep everyone informed about these developments, if and when they come to fruition.